Imports of Chinese goods fell by 11% in one month, despite a stronger US economy. Latest data from the US Census Bureau also shows a decrease of exports to China by 5%. The trade deficit with China fell to $37.9 billion in November from $43.1 billion in October. The overall global US trade deficit dropped 11.5% ($49.3 billion) in November. During 2018, the Trump Administration imposed tariffs on more than 800 categories of goods imported from China, alleging not only unfair trade practices but also national security concerns. In response, China accused the US of starting a trade war and as a retaliatory measure, it also imposed tariffs on many American products. The trade war has a short term negative impact on many industries affected by trade restrictions, not only the ones directly targeted by Chinese tariffs but also those that face higher prices on intermediate products. Others benefit from lower competition. In the short term, the effect of these policies is a decrease in international trade volume. Latest data from the United States Census Bureau, of November 2018, seems to confirm that imports from China are experiencing a slowdown, despite a stronger US economy. November imports were 11% lower versus October 2018. In 2017, they were about the same. Recently imposed tariffs could already be lowering the imports of Chinese goods. At the same time, US exports to China decreased 5% (not seasonally adjusted), whereas in 2017, November exports were 1.5% lower versus October. 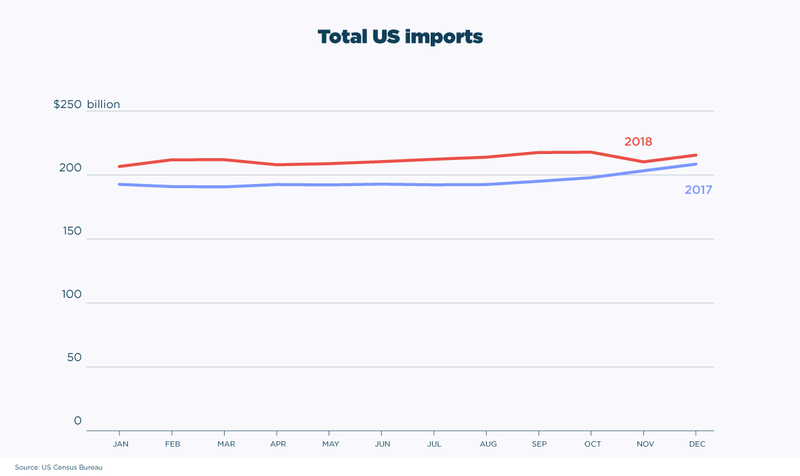 In November, the trade deficit reduced 12% (versus October same year, whereas in 2017 November trade deficit was about the same as October 2017). But not all this reduction in the trade deficit is due to the recent trade policy. The American economy is experiencing strong economic growth and China’s economy is slowing down. The isolated effect of these economic growth trends is a deceleration of the trade imbalance between China and the United States. During the last years, China emerged as a global industrial superpower. 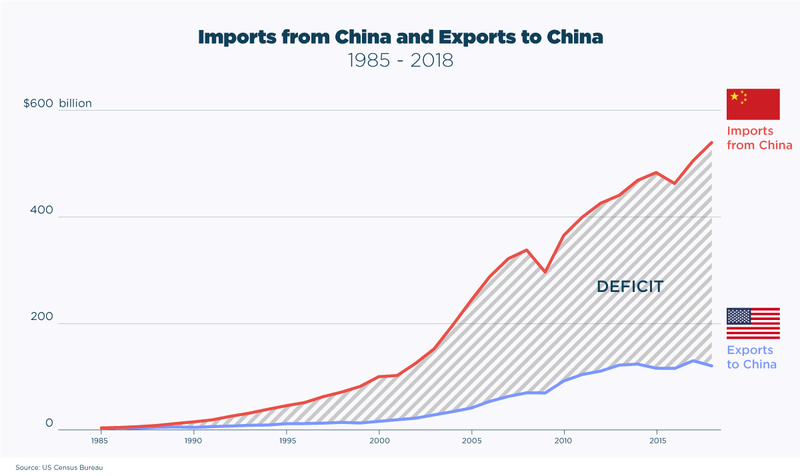 Three decades ago, China’s trade with the US was almost insignificant. But it quickly grew in importance. In 2007, imports from China surpassed those from Canada, the former biggest US trade partner. But the trade relationship with China is much less balanced. An increasing trade deficit and a growing share of imports of high tech products characterize trade with China. For many years, imports from China were mainly low-tech manufacturers. But China tech imports have been gradually increasing. Since 2011, the import volume of high tech manufactures is bigger than those of low tech. Many American consumers benefit from lower prices and a larger variety of final products, like phones, shoes and household appliances. Many American firms also benefit from trade with China, by importing capital and intermediate goods, like industrial machinery. This, in turn, leads to a more competitive American industry, at least in some sectors. But Chinese competition also poses a threat in many other sectors. From steel and aluminum production to manufacturers in diverse sectors, many companies compete with Chinese imports. China is quickly gaining advanced technological knowledge. In a few years, probably, new Chinese firms will be competitive in very high technology intensive industries, like semiconductors. Long Term: Clash of World Titans? The trade imbalance may not be the only point of contention between these two countries. Different sets of values, political systems and social orders are also reasons to be concerned. China is a big country with big ambitions. Chinese economic reform and opening started in 1978 and led to a long period of extraordinary growth rates. Millions of Chinese left poverty behind and substantially raised their living standards. China is building or helping to build large infrastructure projects that will improve and lower the cost of the international flow of Chinese goods. Its Belt and Road plan aims to create a network of interconnected roads and maritime shipping lanes that will improve the flow of Chinese goods in Asian, European and African countries. The project, part of a long term economic development plan, involves the construction of infrastructure like roads and ports in more than 60 countries. Chinese government and firms are engaging in construction on an unparalleled scale. Central planning is helping Shenzhen to become a global tech hub and a rival to San Francisco’s Silicon Valley. Big Chinese firms also count on government support to expand their operations. As a global superpower, many American analysts view China as a potential threat to the United State's political and economic influence in many regions. The confrontation between these giants goes beyond economic concerns and the figure of Donald Trump. Many analysts view China as a risk to US national security and are asking for more action to slow China’s rise. Trump's administration could be taking advantage of those concerns to justify more protectionism. 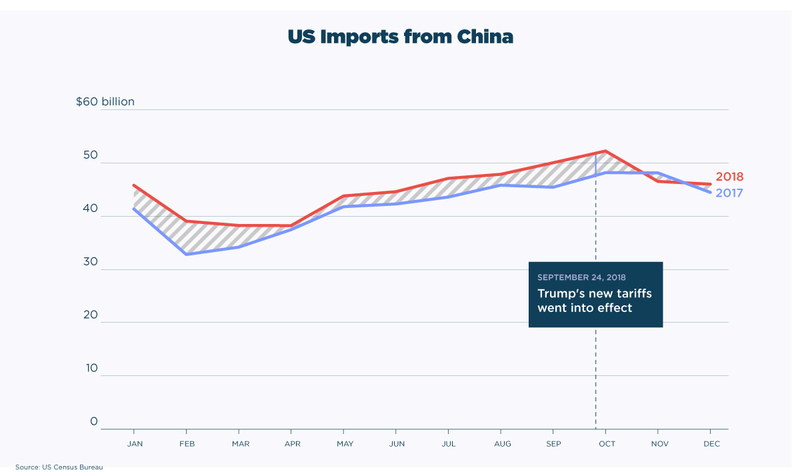 After all, Trump positioned himself against more trade liberalization. Investment restrictions in China and its buyout of foreign firms is viewed with concern in other parts of the world. Companies from Germany, England, Italy, and France are being bought by Chinese firms to quickly acquire technology knowledge. The associated technology transfer allows Chinese firms to quickly import technology knowledge and become more globally competitive. 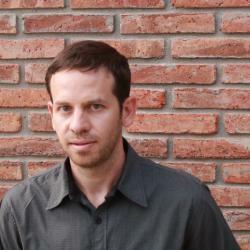 Federico Anzil is an economist and data analyst. He is the founder of EconomicPoint and ZonaEconomica. His fields of research include public policy and social issues. He applies empirical research and economic theory to provide alternative points of view. 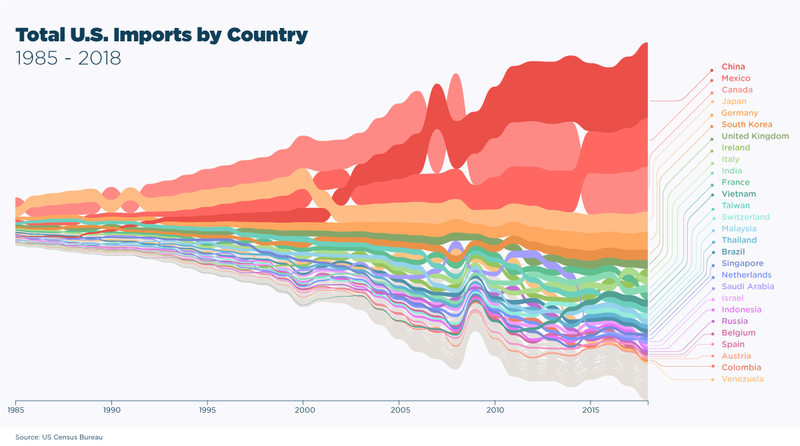 Want to create beautiful data visualizations with the click of a button? 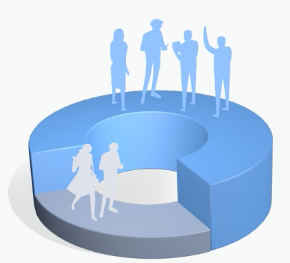 Start creating charts and graphs within minutes with our easy drag-and-drop software. Access dozens of graph tools right now.